So if you're keeping up with my Instagram account (@practicallyspeeching) and my "instaCFY" endeavor, you know that I spent my day in the bookstore yesterday! Yes, I was the nerd trolling through the picture books, laughing at Amelia Bedelia...total nerd, I know. ANYWHO, I discovered the educator discount for B&N (20% off) and since I love a good sale I went a little wild. I listed my book haul for you yesterday on Facebook, and I'm super excited about the activity I just finished with one of them! I put together this 20 page packet to focus on language goals you may have with your students. It's geared a bit more towards the little ones, but you can always modify and branch up if you need. 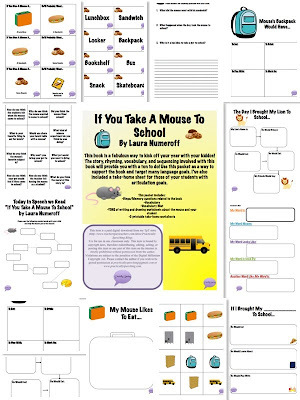 There are a few writing assignments that can come from this and a few that are included. In addition to reading the book and using the packet, I'd recommend getting a backpack and filling it with items from the book - pencils, cookies, notebooks, etc. I think adding something tangible to your lessons always is a home run for our kids. ALSO I'm trying this new "collage" app for the mac to display all the photos from my activities. What do you think?? 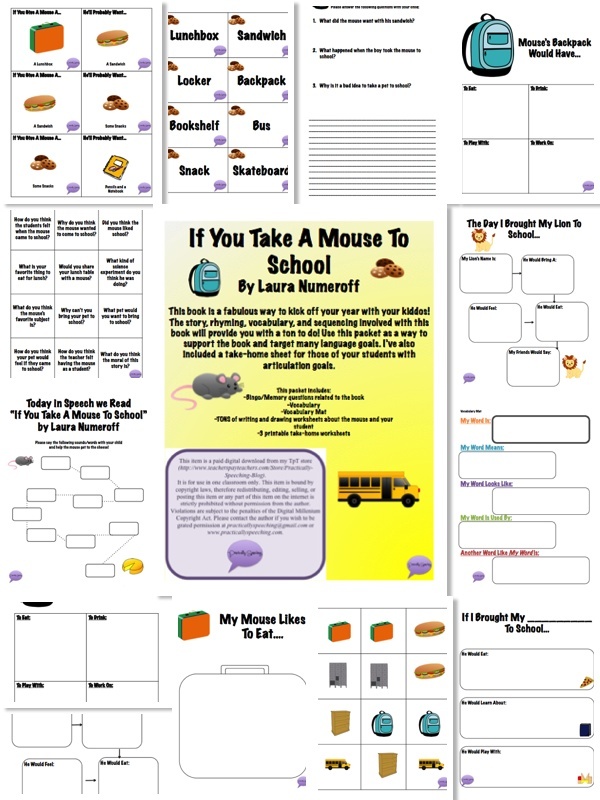 Download this great activity HERE on TpT and have a ball with that funny little mouse!